It's not just that banks are no longer needed--they pose a needless and potentially catastrophic risk to the nation. To understand why, we need to understand the key characteristics of risk. 2. Technology only enhances banks' tools to skim profits; it does not undermine the fundamental role of banks. 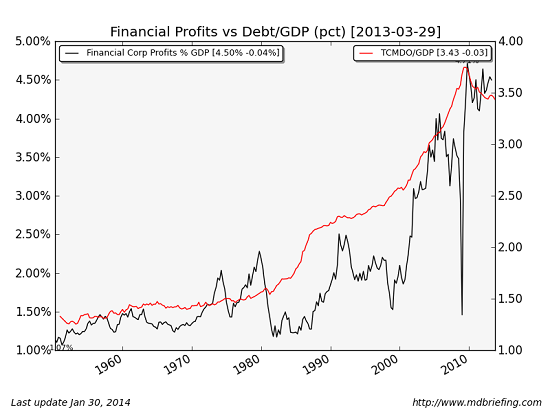 The global financial meltdown of 2008-09 definitively proved riskless bank debt is an illusion. If you want to understand why risk cannot eliminated, please read Benoit Mandelbrot's book The (Mis)Behavior of Markets. Technology does not just enable high-frequency trading; it enables capital and borrowers to bypass banks entirely. I addressed this yesterday in Banks Are Obsolete: The Entire Parasitic Sector Can Be Eliminated. Unfortunately for banks, higher education, buggy whip manufacturers, etc., monopoly and propaganda are no match for technology. Just because a system worked in the past in a specific set of technological constraints does not mean it continues to be a practical solution when those technological constraints dissolve. The current banking system is essentially based on two 19th century legacies. In that bygone era, banks were a repository of accounting expertise (keeping track of multitudes of accounts, interest, etc.) and risk assessment/management expertise (choosing the lowest-risk borrowers). Both of these functions are now automated. The funny thing about technology is that those threatened by fundamental improvements in technology attempt to harness it to save their industry from extinction. For example, overpriced colleges now charge thousands of dollars for nearly costless massively open online courses (MOOCs) because they retain a monopoly on accreditation (diplomas). Once students are accredited directly--an advancement enabled by technology--colleges' monopoly disappears and so does their raison d'etre. The same is true of banks. Now that accounting and risk assessment are automated, and borrowers and owners of capital can exchange funds in transparent digital marketplaces, there is no need for banks. But according to banks, only they have the expertise to create riskless debt. Moral hazard is what happens when people who make bad decisions suffer no consequences. Once decision-makers offload consequence onto others, they are free to make increasingly risky bets, knowing that they will personally suffer no losses if the bets go bad. The current banking system is defined by moral hazard. "Too big to fail" also means "too big to jail:" no matter how criminal or risky the bank managements' decisions, the decision-makers not only suffered no consequences, they walked away from the smouldering ruins with tens of millions of dollars in personal wealth. Absent any consequence, the system created perverse incentives to pyramid risky bets and derivatives to increase profits--a substantial share of which flowed directly into the personal accounts of the managers. The perfection of moral hazard in the current banking system can be illustrated by what happened to the last CEO of Lehman Brother, Richard Fuld: he walked away from the wreckage with $222 million. This is not an outlier; it is the direct result of a system based on moral hazard, too-big-to-jail and perverse incentives to increase systemic risk for personal gain. And who picked up all the losses? The American taxpayer. Privatize profits, socialize losses: that's the heart of moral hazard. Concentrating the ability to leverage stupendous systemic bets in a few hands leads to a concentration of risk. Just before America's financial sector imploded, banks had pyramided $2.5 trillion in dodgy mortgages into derivatives and exotic financial instruments with a face value of $35 trillion--14 times the underlying collateral and more than double the size of the U.S. economy. In a web-enabled transparent exchange of borrowers bidding for capital, the risk is intrinsically dispersed over millions of participants. Not only is risk dispersed, but the consequences of bad decisions and bad bets fall solely to those who made the decision and the bet. This is the foundation of a sound, stable, fair financial system. In a transparent marketplace of millions of participants, a handful of participants will be unable to acquire enough profit to capture the political process. The present banking system is not just a financial threat to the nation, it is a political threat because its outsized profits enable bankers to capture the regulatory and governance machinery. The problem with concentrating leverage and moral hazard is that risk is also concentrated. And when risk is concentrated rather than dispersed, it inevitably breaks out of the "riskless" corral. This is the foundation of my aphorism: Central planning perfects the power of threats to bypass the system's defenses. We can understand this dynamic with an analogy to bacteria and antibiotics. By attempting to eliminate the risk of infection by flooding the system with antibiotics, central planning actually perfects the search for bacteria that are immune to the antibiotics. These few bacteria will bypass the system's defenses and destroy the system from within. The banking/financial sector claims to be eliminating risk, but what it's actually doing is perfecting the threats that will destroy the system from within. Another way to understand this is to look at what happened to home mortgages in the runup to the meltdown of 2008: the "safest" part of the financial sector ended up triggering the collapse of the entire pyramid of risk. Once we concentrate risk and impose perverse incentives and moral hazard as the foundations of our financial/banking system, then we guarantee the risk will explode out of whatever sector is considered "safe." Once you eliminate the "risk" of weak bacteria, you perfect the threat that will kill the host. The banking sector cannot be reformed, for its very nature is to concentrate systemic risk and moral hazard into breeding grounds of systemic collapse. The only way to eliminate the threat posed by banks is to eliminate the banks and replace them with transparent exchanges where borrowers and owners of capital openly bid for yield (interest rates) and capital. Bankers (and their fellow financial parasites) will claim they are essential and the nation will collapse without them. But this is precisely opposite of reality: the very existence of banks threatens the nation and democracy. One last happy thought: technology cannot be put back in the bottle. The financial/banking sector wants to use technology to increase its middleman skim, but the technology that is already out of the bottle will dismantle the sector as a function of what technology enables: faster, better, cheaper, with greater transparency, fairness and the proper distribution of risk. There may well be a place for credit unions and community banks in the spectrum of exchanges, but these localized, decentralized enterprises would be unable to amass dangerous concentrations of risk and political influence in a truly transparent and decentralized system of exchanges. Thank you, Ken C. ($50), for your outstandingly generous contribution to this site -- I am greatly honored by your steadfast support and readership. Thank you, Scott S. ($50), for your monumentally generous contribution to this site -- I am greatly honored by your support and readership.